I have really fallen in love with Kalmbach's "The Absolute Beginners Guide" series, and the most recent addition is no exception. 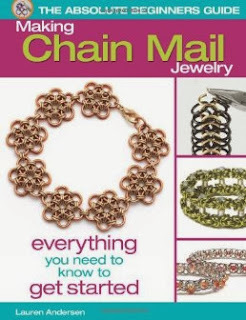 Lauren Andersen has written Making Chain Mail Jewelry for the series, and if you've got chain maille on your list of techniques to master in 2014, this book is a great place to start. Check out this statement by Kalmbach: "Open. Close. It's that easy!" It is, yes, they are right. But in Lauren's capable hands, you see how opening and closing jump rings can become an art form! It's so easy to follow the instructions in this book. The photos are very clear, and different colors are used in the basic instructions so that you can easily tell how the rings are being manipulated. You will learn seven basic weaves and then use them to create 18 beautiful chain maille projects, some super-simple and some which will challenge you to move ahead. So pick up your jump rings and two pair of pliers, and you'll be making chain maille jewelry in absolutely no time! Cyndi, thank you for the review. I am a fan of Lauren Anderson's chain maille - I already own the booklets she wrote.